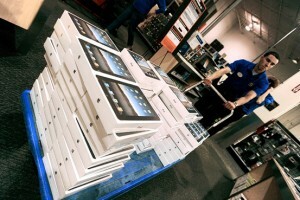 $60,000 worth of iPads Stolen from Best Buy in 60 Seconds! Now this is straight out of a movie! Florida Police are looking for three men that stole $60,000 worth of iPads from a local Best Buy in a flat 60 seconds. The trio broke into a Best Buy early in the morning Monday and made away with 60-90 iPads. The local news reported that Lee Sheriff’s Office deputies responded to an alarm activation at Best Buy located in Coconut Point, 8000Mediterranean Drive, Estero, just before 5 a.m. They found the rear door pried open and merchandise on the ground. The store’s manager said an initial check showed a cage door pried open and 60 to 90 Apple iPads missing. The manager estimates the value to be about $60,000.00, according to reports. The men were reported to be dressed in black and specifically searched for iPads on entering the store. According to Best Buy surveillance video it took the thieves one minute to grab the iPads, drop them in a black bin, and walk out the back door. Did you know back in May, burglars in Ohio stole 24 MacBooks and an iPad from an Apple store in under 30 seconds. Is this a benefit of having ultra light Mac books and iPads?! 3 million iPads sold in 80 days! Best Buy Sales Staff get iPads for Free! Previous Windows 8 to Crush Mac OS!